Why use a wet bag? Someone asked me, why not just use a zip lock bag. Well have you ever tried to machine wash a zip lock bag? I personally haven’t, but it is not something I want to try. :) The beauty of a wet bag, is if it gets soiled, you can wash it with the diapers. If it is just a bit wiffy from a few uses with just pee’d diapers, then I put it in the wash with my son’s clothes. Then the other big disadvantage of a zip lock bag is it is clear … so that means you get to see the poopy diaper you stuffed into it. A wet bag is not clear, so it discretely hides the mess. And the best thing about a wet bag, to me at least as someone who is addicted to fabric, is they come in such cute fabrics (well most of them anyway). Well I sure can’t think of any! And if you use mama pads, wet bags are great for storing them in. And I even found mama pouches for my store. Made by a WAHM friend, these double zippered wet bags keep clean ones on one side and soiled ones on the other side. I and my sewing friends make wet bags. I have a couple of standard sizes but I can make them to the size you want, and I have a lot of fabrics to choose from. What size do you need? Well that really depends on your lifestyle. If you tend to go out for only short trips where you only really do a couple of diaper changes while out, a medium works great for this. I do suggest having at least two bags, so that while one is in the wash, you still have one in use. If you are out alot for longer periods of time, then you will likely want a large wet bag. I personally have three medium bags. We tend to only go out for a couple of hours at a time, and for those couple of times where we have been out for the whole day (thanksgiving and christmas), I just take all three bags with me for that day. Large bags also make great alternatives to a diaper pail. If you have limited space, then you can hang a wet bag on a door knob or the like, and store your soiled diapers in there until washing. Then you can wash diapers, bag and all. 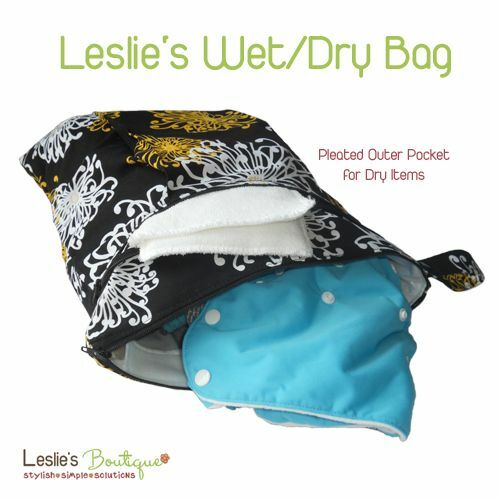 Even if you have not taken the step to cloth diapers, wet bags are still great to have. They are great for wet clothes, bringing home those dirty diapers you cannot dispose of while out, and great for swimming trips.